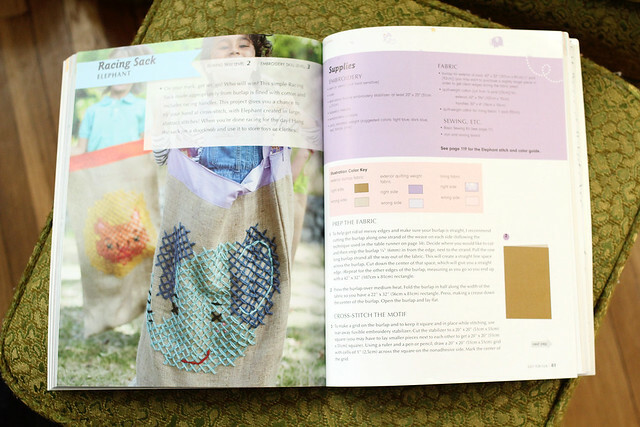 My friend Alyssa just sent over her new book called Sew & Stitch Embroidery and we've been having a good time looking through it. I've been online pals with Alyssa since my early days of plush stitching, so it's so neat to see how far she's come! Actually, Alyssa and I did a swap way back when and she has one of my very first horses! Hope and I decided to tackle a little cross-stitch project out of the book first. We both really enjoyed flipping through the book and planning our next activities. I think once she finishes this one up, it will hang proudly on her wall. 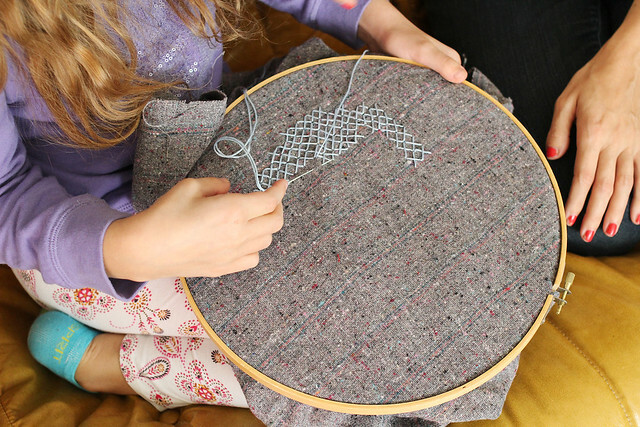 Do you remember your first crafty endeavors? It feels so great every time you tackle something new! 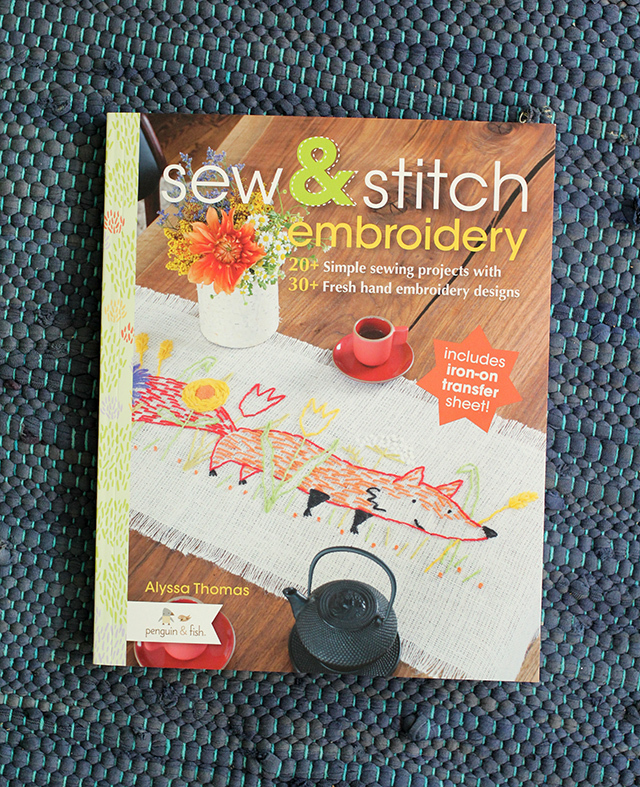 Be sure to check out Alyssa's book Sew & Stitch Embroidery if you're looking for a good crafty-type book. I'm proud of you, Alyssa! How sweet.. Can't wait till the day I get kids, and the grow up to be big enough, so i can make crafty projects with them. Wuhu! Beautiful photos of an awesome moment! This makes me all teary eyed thinking about when I'll be able to start teaching my daughter how to craft. Love the look of this book. I think I'll be adding it to me xmas wish list. Fun! What a great idea! Love the cute patterns! My grandmotehr taught me to sew and knit when I was a little girl. It is some of my fondest memories. I remember the first time I cross-stitched, which was last year. I was living with my grandparents and my Grandma showed me all of her craft supplies. I picked out a tea cup pattern with hearts and finished it. It was so nice to spend that time with my Grandma as she showed me how to stitch! You and your daughter will cherish this time forever! Just added this book to my amazon wishlist! Once I get a little more competent with sewing in general I want to tackle some embroidery crafts, I used to do it when I was a child and loved it. What a fun darling idea! Love the pattern you picked too- she is going to be happy she knows how to do this! what a talent, and so darn cute at that! I remember when my mom taught me how to embroider, I loved it! I am about to work with my middle schoolers on sewing on monster faces to a fabric and I am so excited! How cute she looks so serious. 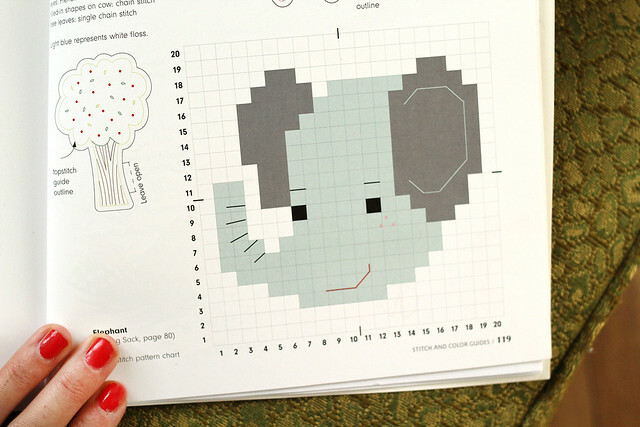 That looks like the cutest embroidery book! I love that Hope is learning how to embroider! This looks like such a fun mother-daughter activity! I helped my kid sister finish sewing her shorts for class. She isn't very handy with the needle so I'm glad I was able to help her with her project! Can't wait to do more sewing too! She got some Care Bears and a cloud car for her bday but sadly, the castles are a bit expensive online. We made our own! And P.S. That Mickey Mouse shirt... please expound on that! I'm lovin it. what a lovely thing to do! sweet mom daughter bonding time! So cute! I hope you show pictures of the end product. Perfect happy time! But I must ask what kind of fabric are you using to work on (in your pictures)?